Gently poach chicken breasts in chicken stock on medium heat. Put aside both stock and chicken separately. Add Life's Good Laksa Paste to a hot heavy based pan and fry until fragrant. If unaccustomed to spicy food, use only two tablespoons of paste. Slowly incorporate previously set aside stock and stir until combined. Add coconut milk or coconut cream and combine. Slice chicken and simmer gently in soup for 10 minutes. To serve, place portion of prepared rice noodles in each of the four serving bowls. Top with raw thinly sliced vegetables and ladle hot Laksa soup and chicken over the top of the noodles and vegetables. Top with bean sprouts, fresh chilli to taste and fresh herbs. TIP! Try this recipe with green prawns added to the Laksa soup when sliced chicken is added prior to simmering for 10 minutes. 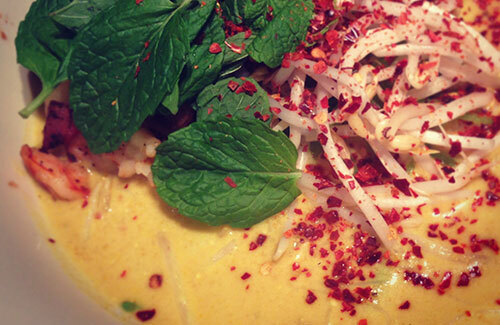 Chicken and Prawn Laksa is a treat to be tried at least once!! !